The Institute of social sciences and humanities – Skopje, with the support from the Rosa Luxemburg Foundation is proud to announce the organizing of the School for politics and critique 2016 – “Regional Political Forum on Marxist Theory and Practice in the Southeast Europe” with the participation of the following speakers: Silvia Federici, Santiago Zabala, and Gal Kirn. The School for politics and critique 2016 is dedicated to current political issues in the region, questions related to its shared communist past and the possibilities of thinking Marxism based on the intersections of our once Eastern and now Western legacies of socialist theory and praxis. By bringing together activists and scholars, the event will aim to address the issues on political strategies for future action that are being discussed simultaneously by various groups in the region and which bring forward political and theoretical content that is globally relevant. The School for politics and critique 2016 aims to explore current Marxist and feminist though relevant to devising political actions of various activist/political groups. It aims to strengthen emancipatory knowledge in times of both neoliberal attack via the economy and social depletion of the working people and the reintroduction of much cruder patriarchic and traditional values through various sets of conservative policies. Acknowledging the emancipatory potential of the interplay of theory and practice, the event will aim to contribute to the rethinking of emancipatory practices in the Balkans by way of opening a discussion within the contemporary Marxist thought. 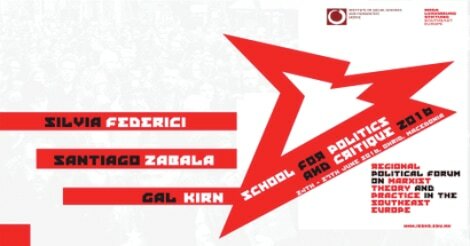 Therefore, we are delighted to announce the participation of Silvia Federici, Santiago Zabala and Gal Kirn, three distinguished scholars and activists who will share their thoughts with the participants of the School for politics and critique 2016. ​The event is bringing together 25 local and regional activists from Southeast Europe and scholars in an engaged debate on contemporary socialist and Marxist thought on political strategies of emancipation from 23rd – 27th of June 2016 in Ohrid, Macedonia.